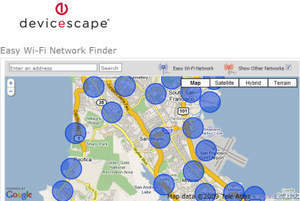 SAN BRUNO, CA--(Marketwire - October 22, 2009) - Devicescape today announced the Easy Wi-Fi Network (www.easywifi.com), the first-ever free access to the world's largest Wi-Fi Network. This new Network delivers a high-quality hotspot network, which combines global Wi-Fi access with an easy-to-use hotspot map finder. Easy Wi-Fi allows you to find and connect to hundreds of thousands of hotspots all over the world and it is monitored 24/7 to guarantee optimal Wi-Fi connection performance. Consumers have stated loud and clear they want their Wi-Fi. In its recent Q2 2009 "Devicescape Wi-Fi Report," the company tapped into its more than two million member base to uncover what users want from Wi-Fi. An overwhelming 93 percent stated they are making buying decisions based on built-in Wi-Fi, 84 percent insist on hassle-free access to Wi-Fi, and 53 percent will only use free Wi-Fi. This research drove Devicescape to build upon its already highly popular Easy Wi-Fi consumer product line and introduce the Easy Wi-Fi Network. Beyond Easy Wi-Fi, members can also personalize their other networks to include all their hotspot accounts, such as Wi-Fi that is bundled with their cellular or home service, commercial accounts or communities they may belong to such as university campuses. This personalization allows users to extend their map view to include Easy Wi-Fi hotspots with their other accounts. When a user has personalized their account, the map finder will be updated to include all their hotspots, allowing them to be logged in automatically everywhere. The Easy Wi-Fi Network is free. To become an Easy WiFi Network member visit www.easywifi.com or download it from the Apple App Store. Android and Nokia versions will be made available shortly. Easy WiFi gives you free access to the world's largest WiFi network. The Easy WiFi Network is a global, high-quality network, formed from a continuous process of discovery, classification, and monitoring of all the WiFi hotspots encountered by our users. We ensure that the locations our users see are ones which everyone can see and use. The more everyone uses the Easy WiFi Network, the bigger and better it gets! Devicescape is the leader in Easy Wi-Fi. The company has worked with device manufacturers and service providers since its inception and has hundreds of design wins in the best Wi-Fi products. Easy WiFi allows for the creation of superior products which are powerful, yet easy to use and compatible with a global network market. Headquartered in San Bruno, California, the company is privately held and backed by leading venture capital companies including Kleiner Perkins Caufield & Byers, August Capital, Enterprise Partners, and JAFCO. To learn more, please visit http://www.devicescape.com. Easy WiFi Network, free access to the world's largest WiFi Network. The more you use it, the bigger it gets.